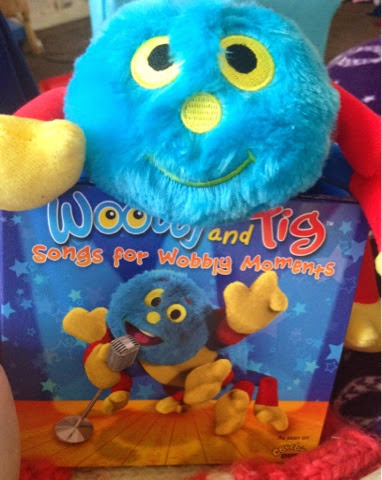 Last week we received a copy of 'Songs for wobbly moments' the new CD for children from CBeebies hit series 'Woolly and Tig'. Along with the CD we were sent a lovely Woolly the spider cuddly toy for Gracie to enjoy. The CD contains 20 different songs all with a different lesson to teach children. Whether it be teaching them important lessons like 'How to turn anger into laughter' in the song 'Big Stomps' to teaching them to make light of what can be scary situations for children such as 'making going to the doctor or the dentist funky fun' in song 'Funky Dunky'. 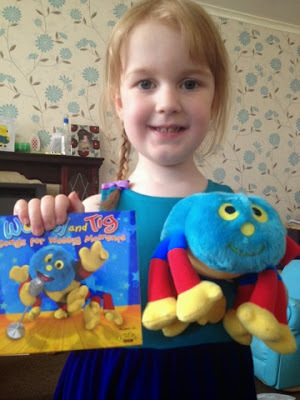 For those who haven't watched 'Woolly and Tig' on television, it is a series about a little girl named Tig and her toy spider Woolly who together, explore all the feelings that children have when faced with new experiences. Whenever Tig is feeling scared or anxious she can always rely on Woolly to help her get through it. I actually used this CD to occupy the kids while I was doing housework a few times this week. I could hear them laughing and dancing around to the music together. I think it's great that there are lessons for them to learn through the music as at preschool age it's amazing how much they can actually pick up and learn through both music and playing. It's always good to find new creative ways for them to learn. Not only that but any CD that gets them active and playing nicely together is a winner in my eyes. 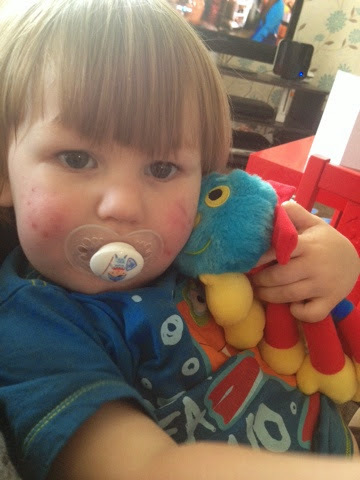 Not only has the CD gone down well but both of the kids have been loving the Woolly cuddly toy, he hasn't been put down all week!! We were sent the products featured free of charge for the purpose of this review. All opinions are my own.